Ten days ago, I posted a picture of the sprouts on my head, along with a picture of grass I grew for my cat. Here is the progress we've both made in just ten days. Yes, I drew an eye on the grass container, just in case you didn't get my subtle analogy. Almost looks like hair, doesn't it? (Me, I mean, not the grass.) It doesn't feel like hair - it feels like that synthetic fuzzy stuff inside a pillow when your dog rips it up and spreads it all over the living room. As soon as I can dye hair without dying scalp, off come the scarves. I'd rather be bald then grey. I really should put on makeup before I share pictures. But, cancer isn't pretty. You know what else isn't pretty? The barf my cat pukes up after eating some of that grass. I'll spare you a picture of that. You are ahead of the game on hair! 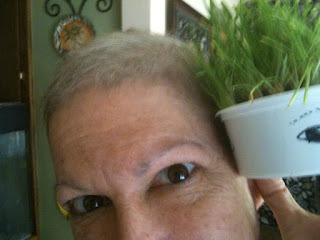 I was completely bald for nearly a month after my last chemo treatment. I still don't have much hair on my legs (that's a good thing!). I know what you mean about bald being better than gray. Henna is okay to use--your hair will be ever so slightly purple, but it is better than gray. My hair came back curly and then it turned super straight. It is thicker than before chemo. I like having hair. You have hair--yeah! Awesome to have hair again. You do need to be careful with hair dyes on post chemo hair. Try something natural from Whole Foods or talk to your stylist. It just doesn't hold the dye the same at first. My hair came in yucky and brown but grew out. I got a hair cut 3 months after my last chemo and chopped off some of the gray. Eventually it went back to normal. Wow, your hair grew in fast! I'm impressed that it's growing while you're still on the Taxol. Fingers crossed that mine will pop out early too! I admit that I am sick of being bald..
Wowee. Your hair did grow in fast. Mine began growing back, ever so slightly, during the taxol, but nothing like yours. You know, you should do a study. Take a picture next week. And the week after. I may do that. Every two week or so, and post back here. I had no doubts my hair would grow back fast though. I'm a hairy woman.